1 foil stamped area on Side 1 of uncoated 100lb Deep Pine Linen stock. H2 business card slits on left pocket. 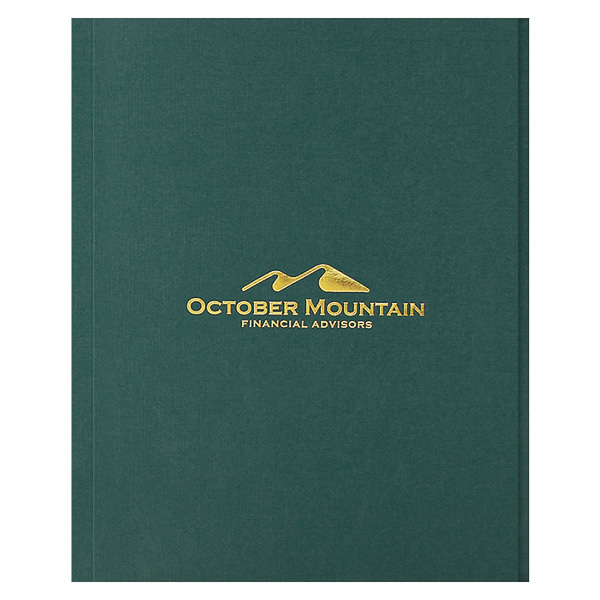 Rich pine-colored stock embodies the October Mountain name, capturing the feel of an evergreen mountain forest. Its slightly rough texture gives the luxurious linen stock the rustic feel of a mountain setting. The financial advising firm's logo is stamped in Metallic Gold foil; its shiny surface reflects light to glamorize the design. The gold coloration even mimics the appearance of new coins. Boehmer Insurance & Investment Group, Inc.
3 foil stamped areas on uncoated 100lb Deep Black Linen stock. H1 business card slits on right pocket. Boehmer Insurance & Investment Group, Inc. projects an immediate sense of wealth and class with this gold-on-black design. The Metallic Gold foil stamping brings light and warmth to contrast the solid black background, which sends its own message of power. Gold also bears strong associations with shiny gold coins, making the foil stamp a stellar match for an investment company. A reinforced backbone and edges protect critical financial documents with ease. Gold foil stamping on the right reinforced file tab brings a bit of shimmer to the inside of the folder, as does the foil stamping on the left pocket. Both areas provide information about Boehmer's mission statement, slogan, and web address to help clients learn more about the company. This product's 1/2" spine lets each pocket carry up to 1/2" of paper, so all your 8 1/2" x 11" presentation materials fit in one convenient package. 1" reinforced edges strengthen both panels, reducing the effects of general wear. The right reinforced edge extends 3/4" past the closed cover to form a file tab. Customize this tab with branded information, or leave it blank so clients can write their own label. Both the reinforced edges and pockets can also be imprinted with an original design or text. Dimension Closed: 9 3/4" x 11 3/4"
Dimension Open: 19 1/4" x 11 3/4"